Agricultural Research Service scientists are studying the relationship between eating behaviors and cognitive control as an avenue to address childhood obesity. ARS photo by Scott Bauer. 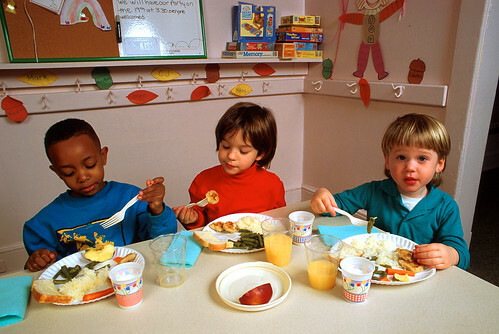 American children are gaining weight. Obesity now affects one in six children and adolescents in the United States, according to the Centers for Disease Control and Prevention. It’s a major concern because extra pounds can increase risk for developing serious health problems in children, including diabetes, high blood pressure and high cholesterol. While strategies to reduce childhood obesity include improving diet and increasing exercise, USDA scientists are looking for ways to prevent behaviors in children that may lead to obesity. Nutritionist Kevin Laugero, who works at the USDA Agricultural Research Service’s (ARS) Western Human Nutrition Research Center in Davis, California, recently investigated the relationship between obesity, unhealthy eating behaviors and decreased mental skills in 3- to 6-year-olds. Laugero and his colleagues at the University of California-Davis discovered, for the first time, a connection between young children’s eating behaviors and experiencing an emotional state. The team also found that mental skills, referred to here as “cognitive control,” are significantly associated with overeating and emotions. Cognitive control allows us to remember, plan, organize, make decisions, manage time, maintain emotional and self-control, and curb inappropriate behavior. Researchers conducted several experiments to examine the balance between emotional state, snacking and cognitive control in preschool children. Cognitive control was measured through computerized and hands-on tasks, parent questionnaires and standardized teacher reports. Next Next post: The Healthy Eating Index: How Is America Doing?